Johanna Ahlm and Line Thorius arrive to strengthen the backcourt of coach Vestergaard. Viborg HK signed players to help them out at times of trouble when many of the handballers are not ready for injuries or pregnancies. This week, Viborg HK signed a 21-year Swedish playmaker, Johanna Ahlm. The national team player arrived on loan from Aalborg DH for the rest of the season. Ahlm will be mainly a reserve of Kristine Lunde-Borgersen, who is out with knee injury probably until Christmas. “Obviously, this was not what I expected when I joined Aalborg this summer. I felt well there, but now that I am in Viborg I feel very well here too. Viborg is one of the best teams in the world, so of course I’m happy to be part of it,” Johanna Ahlm said, as the loan deal was announced. “Johanna is an extremely good playmaker and a fine “reader” of the game. We needed a player who could lead our fast-breaks and who could also design our attacking game. This is a role Johanna can fill and at the same team she is a playmaker who can shoot well. 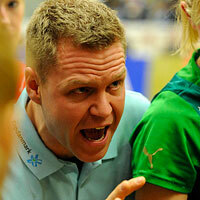 I expect much from her in our team,” Viborg´s head coach Jakob Vestergaard said. “For us it is a question of reducing the costs and we believe we can still do well without Johanna as we still have 21 players in our squad,” Aalborg DH´s managing director Jan Hansen said about the controversial transfer. Actually, Viborg coach Jakob Vestergaard could welcome no less than two new playmakers this week. Former Aalborg DH players Line Thorius who had no club at the moment also joined Viborg until New Year. “Line needed a club and we needed a backcourt player, so we allowed her to train with us for a while. That looked okay, so we chose to include her in our squad,” Jakob Vestergaard said. “We realise that she has been out with an injury for a long time, and therefore we cannot expect a lot from her from the start, though”, Vestergaard added. “I am still recovering following a shoulder injury, but I’m ready for active duty, and then we will simply have to see how things turn out. To me it is a huge opportunity to be part of this team, and I will of course do all that I can to help the team in return," 28 year Thorius said. As eurohandball.com has reported before, Viborg are still missing injured Bojana Popovic and Nora Reiche, apart from above mentioned Lunde-Borgersen, while Grit Jurack and Louise Bager Due are both pregnant and out for the season. This was reflected in the form of Viborg. They lost two of their first five matches in the Danish league this season – 22-15 at home against KIF Vejen and 25-17 away against Champions League colleagues FCK Håndbold.